When I was a Peace Corps volunteer in Western Samoa, I loved snorkeling on the reefs. Although stunningly beautiful, the reefs harbored real dangers, such as highly venomous sea snakes, moray eels, spiny sea urchins, lion fish, and sharks. As I paddled about on the surface of the water, I was justifiably jumpy. If anything brushed against me, like coconut, I'd freak out. One day I swam alone, leisurely floating on the surface, in awe of the staghorn coral just yards beneath me. Suddenly something brushed against my leg. As usual, I was jolted and turned to see what was attacking me. It was a dead horse. When I recount this true story, I always love to see the surprise on the listener's face. A dead horse is the last thing anyone would have guessed. They remember the story, because of the shock of the surprise. What Does YOUR Friday look like? To be memorable, I believe the best artwork also offers up a surprise for the viewer. I try to use a cinder block as my surprise element, used in a way that no one else would have considered. 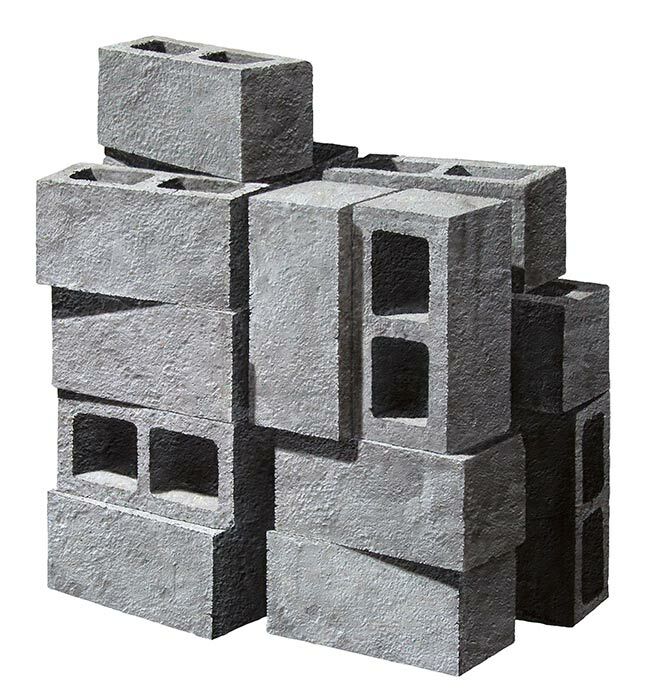 One day I asked myself an unusual question: "What would my mental state on different days of the week look like if represented by piles of cinder blocks?" Many people look at me strangely when I tell them about this series, especially at cocktail parties. I rarely get the chance to brag that Monday is in the permanent collection of the Frost Art Museum, that Friday, was exhibited at the Boca Museum of Art, and that Wednesday helped me win the South Florida Cultural Consortium Fellowship. I hope YOU enjoy a little surprise. This is probably a good time to remind you that these paintings are completely flat. The shadows and textures are a painted illusion. 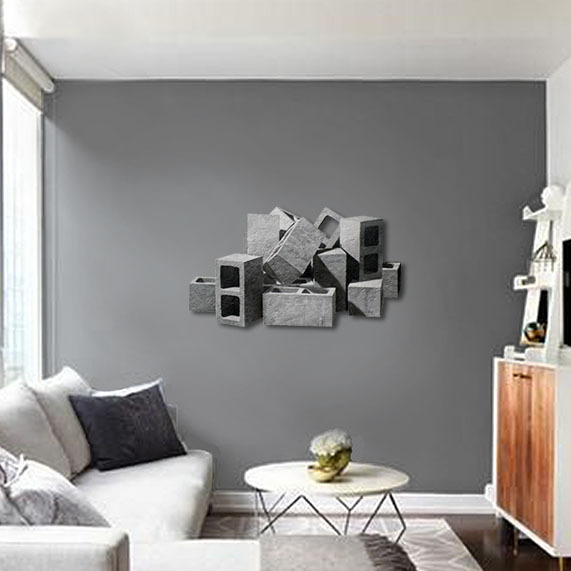 A curator visiting my studio, who had seen images of my work, said he expected installations of actual cinder blocks. He asked me to donate a piece to his museum's permanent collection. When I recount this true story, I always note surprise on the listener's face. A dead horse is the last thing anyone would have guessed. They remember the story, because of the shock. To be memorable, I believe the best artwork offers up a surprise for the viewer. 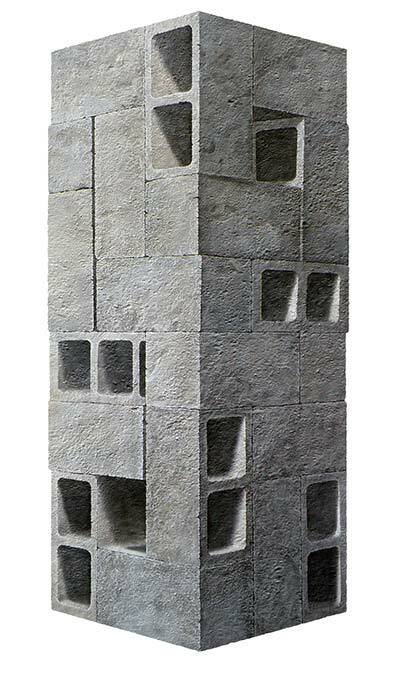 I try to use cinder blocks as my surprise element, used in ways no one would ever consider. 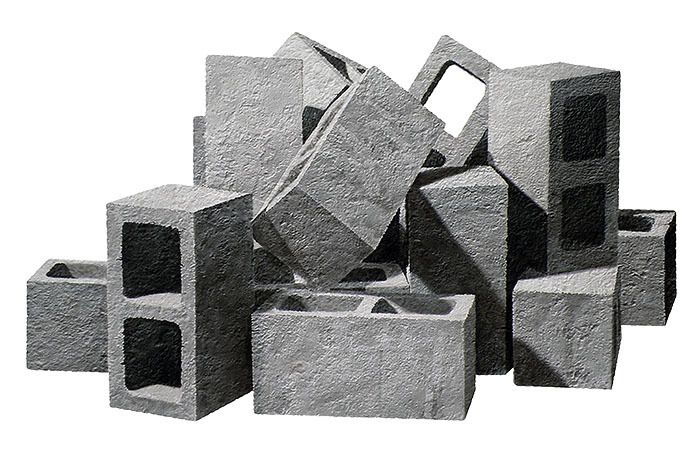 One day I asked myself an unusual question: "What would my mental state on different days of the week look like if represented by piles of cinder blocks?"